I was born and raised in Dublin, Ireland! I’m about to begin my fourth year of Marketing and Innovation Technology at Dublin City University, which is going to be pretty hard after spending a Summer at Google! After high school, it was my dream to go to art school, but when I was offered this course I decided to give it a try. Lucky for me, I absolutely love it! It’s an awesome and super modern course that covers basic marketing practices, but also explores the cutting edge technology and design skills that are needed to become a 21st century marketeer! My Google story actually started about a year ago, when I was asked to participate in Google Adcamp EMEA (read my article about the experience here). If you haven't heard of AdCamp before, it’s 3 days of pure awesomeness! You get to spend those 3 days in the Google office, meet other students from across EMEA, attend product talks from seasoned Google employees, and explore Dublin. I have always had an obsession with technology. More recently my focus has been on mobile and developing my mobile marketing skill set. Google is at the forefront of everything that is “mobile” and “connected” so it became apparent very quickly that this was where I needed to be. 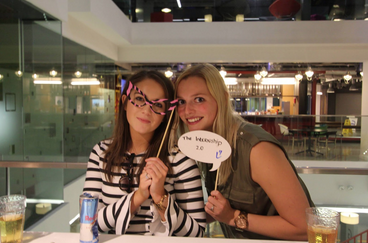 I am a Business Associate Intern and am on the UK SMB Sales team for Google AdWords! I count myself so lucky to be on this team, because I am SO passionate about the product we sell. My role is to help small and medium businesses across the UK scale and grow through the use of Google's advertising solutions (it sounds amazing, I know). The businesses that I work with come in all shapes and sizes, and no one Google advertising solution works for all of them. Adapting and developing unique online marketing strategies for each client is what makes my role so awesome! Every day is different and that is really important to me. I am also working on Customer Education and have formed a Hangout on Air program for my team. We actually had our first live broadcast last week, which went down a storm. The customers loved it! My biggest accomplishment was being able to plan, execute and report on our hangout on air series from start to finish. We targeted the Hangout on Air at 5000 customers, so it was a pretty big project. There were so many stakeholders and being able to manage all is something I am super proud of. My team had never done anything of this scale before and I was delighted that I successfully launched the biggest one yet! I was also able to convince other teams (such as marketing) to support us with various assets, which felt pretty awesome too! 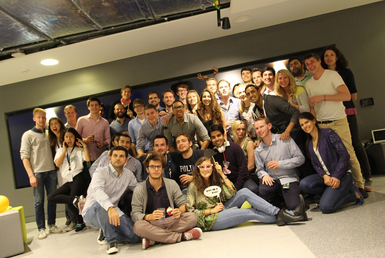 Diversity is one of the best things about working at Google. The ability to work with people from different places and backgrounds, gives amazing opportunities to learn from one another. During my Internship, I was lucky enough to be elected onto the “Intern social committee” which was a small group of interns who ran internal events! The group was made up of Irish, English, Russian, Dutch and Croatian members. A moment that stood out to me, was a brainstorming session when we spoke about the events that we could potentially run! Everyones ideas were so VERY different, but all equally wonderful! I guess it was just interesting to hear about what everyone considered a “normal” or a "frequent" event in their hometown!" When you don't work at Google, you think the perks are the best part. Speaking from experience, I can say that the best part about working here is the unique people. Being surrounded by such smart, enthusiastic and outgoing people, everyday, is incredibly inspiring. There is something fantastically interesting about every person you talk to here. You learn so much from your peers, it’s insane. Being around people like that everyday makes you the best possible version of yourself and it opens your eyes to so many different cultures, mind sets and ways of doing things. I love this question! It’s something I get asked all the time! I honestly think that everyone has a different idea on what Googliness or what being Googley is, but it doesn't matter what it is or whether it's work related or not. It’s a passion that they bring to work and want to share, and use to help their work, their team, or all of Google itself. 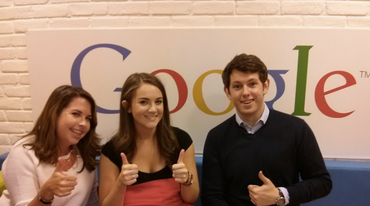 The Google Dublin (EU HQ) is ridiculously cool! I just love it! It spans 4 buildings and there is something totally unique about each one! We have a gym, a swimming pool, dozens of kitchens, a bar, games room, karaoke rooms, nail bars, massage chair ... literally, you name it and it’s probably here! My favourite area is in the Gasworks building. It has an old fashioned library, with hundreds of books and big, comfy armchairs. I get most of my blogging done there. Its just the perfect spot to plug in your earphones and get stuck into some work! After my internship I am returning to college, for my final year of Marketing and Innovation Technology at Dublin City University! As much as I’ll miss Google, I’m looking forward to seeing all of my old classmates and getting stuck into some project work. 1.) BE UNIQUE ― Do you have any idea how many people apply for these internships? No? Well, neither do I, but I’m guessing in the thousands. So it’s important to spend some time thinking about how you're going to stand out from the crowd. Be creative when it comes to your resume, add as many links as you can to your college assignments, any project work you’ve done, videos, slideshows ... you name it! I also think having a nicely formatted resume can do wonders! Enter the Google Online Marketing Challenge: this will show that you have first hand experience with AdWords and running online marketing campaigns. Become a blogger and have your own website: blogging is a great way to raise your personal profile and share your ideas. It also shows recruiters that you are dedicated and hardworking (if you post frequently). If you set up advertising on the blog (Via Google Adsense) and tracking (Via Google Analytics) it instantly shows recruiters you have first hand product knowledge.